Gruzan Architect showing students an interior renovation project. 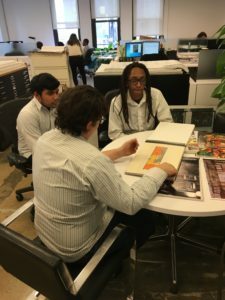 On January 27, students from WHSAD visited Gruzen Samton, an architectural firm, on Wall Street where senior architecture teacher, Mr. Codio, used to work. 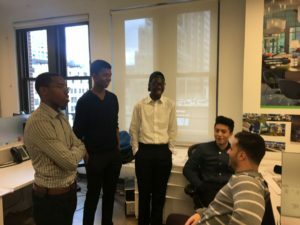 There, students shadowed employees at the firm to grasp what it means to work at an architecture firm. While the students shadowed the employees, they were able to glean a great deal of information from what they observed. Students were able to talk with Susan Wright, the head designer at Gruzen Samton. She taught them about the process of getting clients and keeping them. Then she showed the students how the plans for a building are started and the different types of floor plans for it. Overall, the students enjoyed their time at the firm and were able to learn a few things.